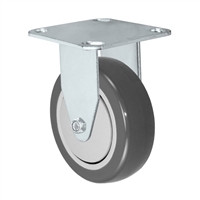 CasterHQ's Light Duty Plate Casters are ideal for most types of equipment and projects weighing less than 1,000 lbs. These Polyurethane wheels are easy to roll, non marking, and highly resistant to grease, oils, chemicals, water and most solvents. 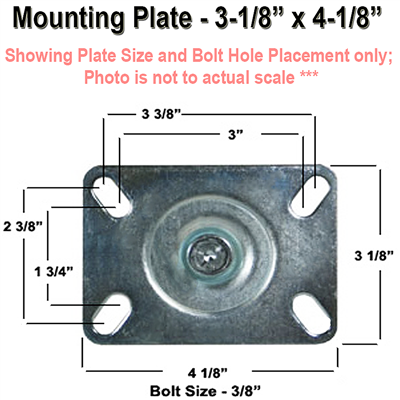 Capacity up to 350 pounds per caster - Plate Size: 3-1/8" x 4-1/8"
CasterHQ's Light Duty Plate Casters are ideal for most types of equipment and projects weighing less than 1,000 lbs. Our light duty plate casters include bright zinc plating on all of our casters for extra rust and corrosion resistance. All Raceways include double ball bearings with hardened raceways for extra strength and durability. 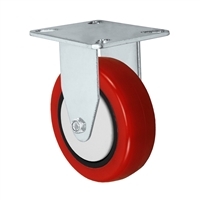 Our Rigid Casters are Pressed or Welded with heavy duty gauge steel for extra strength. The standard axle installed is a 3/8" axle with a lock nut to prevent the axles from becoming loose. This Caster series is commonly sold to Bakery and Food Service Equipment, Institutional, Hotel, and Hospital Equipment, Laboratory Equipment, Material Handling Equipment, Moving Dollies, Office and Store Fixtures, Utility and Maintenance Carts and many more applications. 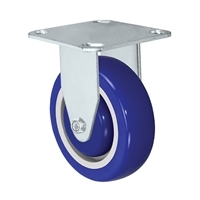 We include a metal dust cover on this series which adds additional protection against dust and debris from getting into the raceway bearings to allow the swivel casters to have an extended life span when comparing different brand casters. 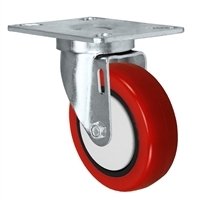 CasterHQ strives to provide the highest quality casters and wheels in the industry and we will not disappoint. With the lowest prices, highest quality casters, and fastest shipping time our goal is to provide you with a solution to your Caster needs with the best customer service in the caster industry. We like to look at ourselves as the Amazon of Casters. Shop our products below and please let us know if you have any questions. The polyurethane on polyolefin core wheels are injection molded polyurethane chemically bonded to a polyolefin core. These wheels are easy to roll, non marking, and highly resistant to grease, oils, chemicals, water and most solvents. We offer this in Gray, Blue, and Red colors for many applications. Swivel Construction - Stamped steel - Swivel has double ball bearing with hardened raceways - Metal cover shields swivel bearings from dirt and dust. 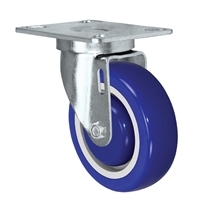 3" x 1-1/4" Rigid Caster | Blue Polyurethane on Polyolefin Core Wheel | 250 lbs Capacity | Plate Size: 3-1/8" x 4-1/8"
3" x 1-1/4" Swivel Caster | Blue Polyurethane on Polyolefin Core Wheel | 250 lbs Capacity | Plate Size: 3-1/8" x 4-1/8"
3" x 1-1/4" Swivel Caster | Gray Polyurethane on Polyolefin Core Wheel | 250 lbs Capacity | Plate Size: 3-1/8" x 4-1/8"
3" x 1-1/4" Swivel Caster | Red Polyurethane on Polyolefin Core Wheel | 250 lbs Capacity | Plate Size: 3-1/8" x 4-1/8"
3-1/2" x 1-1/4" Rigid Caster | Blue Polyurethane on Polyolefin Core Wheel | 275 lbs Capacity | Plate Size: 3-1/8" x 4-1/8"
3-1/2" x 1-1/4" Rigid Caster | Gray Polyurethane on Polyolefin Core Wheel | 275 lbs Capacity | Plate Size: 3-1/8" x 4-1/8"
3-1/2" x 1-1/4" Rigid Caster | Red Polyurethane on Polyolefin Core Wheel | 275 lbs Capacity | Plate Size: 3-1/8" x 4-1/8"
3-1/2" x 1-1/4" Swivel Caster | Blue Polyurethane on Polyolefin Core Wheel | 275 lbs Capacity | Plate Size: 3-1/8" x 4-1/8"
4" x 1-1/4" Rigid Caster | Blue Polyurethane on Polyolefin Core Wheel | 300 lbs Capacity | Plate Size: 3-1/8" x 4-1/8"
4" x 1-1/4" Rigid Caster | Gray Polyurethane on Polyolefin Core Wheel | 300 lbs Capacity | Plate Size: 3-1/8" x 4-1/8"
4" x 1-1/4" Rigid Caster | Red Polyurethane on Polyolefin Core Wheel | 300 lbs Capacity | Plate Size: 3-1/8" x 4-1/8"
4" x 1-1/4" Swivel Caster | Blue Polyurethane on Polyolefin Core Wheel | 300 lbs Capacity | Plate Size: 3-1/8" x 4-1/8"
4" x 1-1/4" Swivel Caster | Gray Polyurethane on Polyolefin Core Wheel | 300 lbs Capacity | Plate Size: 3-1/8" x 4-1/8"
4" x 1-1/4" Swivel Caster | Red Polyurethane on Polyolefin Core Wheel | 300 lbs Capacity | Plate Size: 3-1/8" x 4-1/8"
5" x 1-1/4" Rigid Caster | Blue Polyurethane on Polyolefin Core Wheel | 325 lbs Capacity | Plate Size: 3-1/8" x 4-1/8"
5" x 1-1/4" Rigid Caster | Gray Polyurethane on Polyolefin Core Wheel | 325 lbs Capacity | Plate Size: 3-1/8" x 4-1/8"
5" x 1-1/4" Rigid Caster | Red Polyurethane on Polyolefin Core Wheel | 325 lbs Capacity | Plate Size: 3-1/8" x 4-1/8"
5" x 1-1/4" Swivel Caster | Blue Polyurethane on Polyolefin Core Wheel | 325 lbs Capacity | Plate Size: 3-1/8" x 4-1/8"
5" x 1-1/4" Swivel Caster | Gray Polyurethane on Polyolefin Core Wheel | 325 lbs Capacity | Plate Size: 3-1/8" x 4-1/8"
5" x 1-1/4" Swivel Caster | Red Polyurethane on Polyolefin Core Wheel | 325 lbs Capacity | Plate Size: 3-1/8" x 4-1/8"